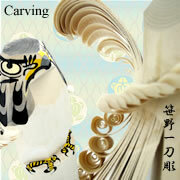 The feature of the traditional Japanese carvings called Sasano-Bori is to make them from one single piece of wood. Sasano-Bori is a unique personalized gift. Those who become a prime minister and promote to higher positions in a company are given a Sasano-Bori. A new born baby is also given a Sasano-Bori whose height is equal to the length of the new born baby. In the old days, when there were no air conditioners, the soothing sound of wind chimes cooled people down during summer. 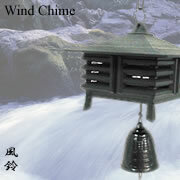 These days, the sound of wind chimes is still regarded as a symbol of summer in Japan. It is said that high frequency sounds (3,000 hertz or higher) can stimulate our brains to secrete stress-relieving hormones. Click the speaker icons to listen to the sample sounds. Experience the Japanese summer sounds and relieve your stress! It is said that water boiled in iron teapots called Tetsubin is the best for making green tea, which explains the popularity of Tetsubin in Japan. 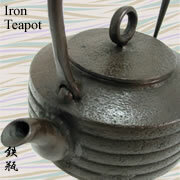 Water boiled in poor-quality iron teapots tastes of iron and thus spoils the taste of green tea. 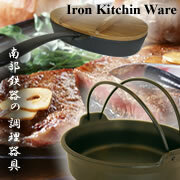 Our ironware is made by famous Oigen Corporation. The quality of Oigen's Tetsubin is guaranteed to be the highest. One special feature of our Tetsubin is that, they are covered with enamel (CLICK HERE), which prevents the iron from dissolving and rusting. 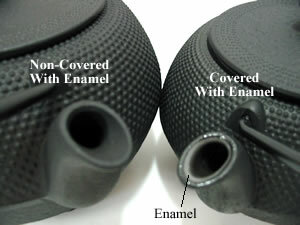 In addition, the teapots can retain heat for a long time, enabling tea-lovers to enjoy a long and relaxing tea time. The best point of iron cookware is to keep tastes in foods by transmiting heat evenly and instantly. Enjoy new dishes and professional-like dishes by cooking foods with iron cookware. 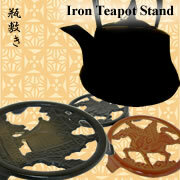 These pot stands are made for putting "TETSUBIN" tea pots on it. Its simple design and strength is suitable for long-time use. Because the lacquer ware is finished by being coated with silver dust and lacquer repeatedly, its color is iridescent and mysteriously beautiful. All the products look exotic and rich, but not too expensive. 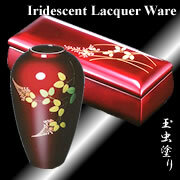 This is why many forign people buy lacquer ware as a souvenir from Japan. 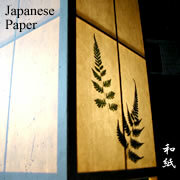 Shiroishi Washi paper is all hand-made and used by many dignitaries including the Japanese emperor. When the Washi was used to record the Japanese Instrument of Surrender ending the Second World War, some foreign generals went to Shiroishi town to see how such a high-quality and strong paper was made. Now Shiroishi Washi paper is made by only one family in Shiroishi town. We accept VISA, Master Card, Discover, American Express, and eCheck via PayPal.